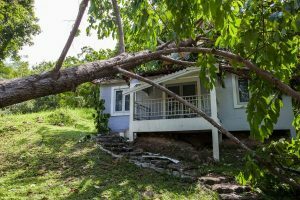 What To Do When A Tree Falls On Your House - Crowe Tree Service Inc.
It’s always best to have a tree removed if you believe that your tree is sick or dead and at risk of falling on your home or property. While it is always best to be proactive and hire a tree removal professional in Ottawa, sometimes that opportunity doesn’t present itself and tress fall down on their own without warning or as a result of a big storm. It may sound like something that doesn’t happen often however recent studies show that more people are killed each year from trees falling down than from shark attacks. That’s right, falling trees are more dangerous than sharks… in a sense. So while we know that tree removal is the best option for safety, if a tree does fall on your property there are some steps you can take to ensure you and your family are safe and to get the cleanup started quickly. The first thing you should do if a tree falls on your property and you are home is evacuate – immediately. The initial damage can be significant and after the tree falls down the danger isn’t over. When big trees fall on a home they usually fall with incredible force and they can cause structural damage to the home that could lead to a collapse of the building. After evacuating your home, you will want to look for fallen power lines as this can be a serious life-threatening hazard and any power lines that have fallen down should be reported immediately and avoided at all costs! The next step would be to call a professional tree removal service in Ottawa to come and assess the situation. A detailed tree removal and debris cleanup quotation will be provided and you can make a game plan with the tree removal company to get started. It’s very important to understand that fallen trees are very dangerous! Even trees that look like they have fallen and aren’t moving may be under great pressure which makes them extremely dangerous to be around. It’s no joke and it is highly recommended to leave the emergency tree removal and clean up to the tree removal professionals to prevent injury and keep your family safe. After contacting a tree removal company in Ottawa you will want to contact the insurance company if your property has been damaged and also contact the city or jurisdiction offices to obtain tree removal permits. Having a tree fall on your house would not be a fun experience. The good news is that if you keep these things in mind then in the unfortunate event that you have a tree fall on your home then the process will be much smoother and there will be a lot less to worry about because you will know exactly what to do. If a tree has fallen on your property and you need emergency tree removal service, please give us a call and one of our tree removal experts will be there to help!